For many years – that was the requisite question asked by the grocery clerk as they prepared to bag the items you just purchased (I also held that gig for a short period as a teenager). Plastic was lightweight, cheap and durable enough to do the job. After the retail & grocery industries incorporated plastic, paper became an afterthought for many of us, even though paper has always maintained a softer environmental impact. Although I was aware of the issues related to plastic and its lack of degradation, I was slow to move on the issue, until I saw a photo that accelerated my growth and heightened my awareness much faster. I don’t think I ever stopped to think – where do those bags end up or how do they affect the quality of life for someone else? Even though I keep re-usable bags with me, I still haven’t done my best to put my best foot forward all the time – but fortunately, the city of Santa Monica (as well as Long Beach, San Fran and a few other cities state-wide) don’t give you a choice anymore. No more – paper or plastic. Either you have your own re-usable bags, you have an incredible ability to carry multiple items in your arms or you’re paying for paper bags. 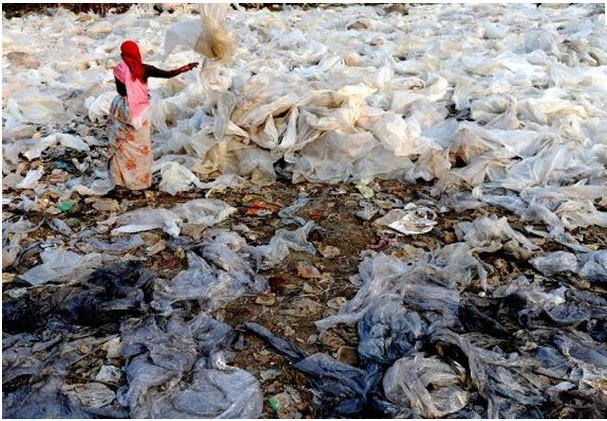 The estimates are that — over 1 trillion plastic bags are used every year with hundreds of millions ending up in the ocean and developing countries that lack the technology to break down the materials. Imagine if that were a photo of your neighborhood? Each year, we consume an estimated 500 billion to 1 trillion plastic bags worldwide. That comes out to over one million per minute. Billions end up as litter each year. Americans alone discarded more than 3.3 million tons of low- and high-density polyethylene bags, sacks, and wraps in 2000 (EPA). Taiwan consumes 20 billion bags a year—900 per person (industry publication, Modern Plastics). Four out of every five bags handed out at grocery stores in the USA are plastic. Staggering statistics. Whole Foods and Trader Joes have banned plastic bags which is one of the many reasons I shop there. Yes I admit it — I need all the help I can get. Hurray for every city with a conscious – a small acknowledgement for giving a damn about the environment is worth the effort. We can all do a little better without a city ordinance twisting our arm right? As I entered Ralph’s in Santa Monica on Friday evening (re-usasble bags in my trunk), I was reminded again when I was asked by the clerk, “Do you have your own bags or would you like to use paper for an additional 10 cents?‘ — No problem. I know I can do better. I challenge you too.